Providing you the best range of restaurant pos software, point of sale software, restaurant billing software, pos retail billing software, retail billing software and garments billing software with effective & timely delivery. Features Restaurant billing software with inventory&receipe management. This restaurant POS software is an efficient and simple online restaurant management system. This software is designed to help restaurant businesses with keeping track of customers, sales, items and stock. We are engaged in offering Point of sales software. Our offered software is extremely well-liked in the market due to performance and accuracy result. This software is developed by professional’s team who has rich industry experience and skill. We offer this software to our customers’ at affordable prices. We are a recognized entity, engaged in offering an excellent quality Restaurant Billing Software to our esteemed clients. Clients can avail this software at pocket-friendly prices. Features Billing software for department store,retails shops like general store. Usage/Application Billing software for department store,retails shops like general store. Retail billing software is developed for customers invoicing, tracking of bills and billing periods. ... So here you need billing software or billing system for your business. In the market, there is a large number of serial billing platforms, each of which has its pros and cons, as well as supporters and opponents. Software designed to handle time and billing tracking as well as invoicing customers for services and products. Garments Billing software can track the hours worked by employees as well as expenses associated with projects or clients. Assisted by our talented professionals, we are offering an exceptional assortment of Department Store Billing Software to our customers. Our team members make sure that the billing software is designed in accordance with the quality standards and norms. Besides, we offer this software in various simple modules. We are engaged in offering POS Software. Our offered software is extremely well-liked in the market due to performance and accuracy result. This software is developed by professional’s team who has rich industry experience and skill. We offer this software to our customers’ at affordable prices. Usage/Application Billing software for department store,retails shops,supermarket like general store. Supermarket Billing Software is a simple software yet one of the most widely known and is build to support an individual or a chain business. It takes care of retail, distribution, accounting. Online Billing Software to handle time and billing tracking as well as invoicing customers for services and products. Online Billing software can track the hours worked by employees as well as expenses associated with projects or clients. Textile Billing software 2.0 is the latest version of Textile Billing Software exclusively for Silk Sarees Shop, Textiles, Readymade Showrooms, and Retail Shops and so on. Our Textile Billing Software can be used by any textile shops from a small showroom to a big shop of multiple users. Our Billing Software has many features like Product Categorization, Product Code Options, Fixing Cost based on the Material or the Pieces, Inventory, Stock Management, Accounts Management and complete Sales Profit and Loss Report. The Textile Focus Billing 2.0 Software has been used in Kanchipuram Silks Saree Shops and this Billing Software is very much useful for Textile Management. 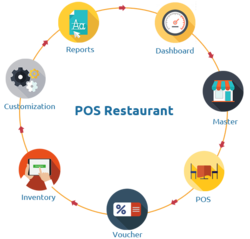 We have wide variety of Billing SoftwareDevelopment for various industries such as Stone Crusher, Agents, Distributors, Retailers and Shop owners. We can also customize the billing software to suit your requirement.If you have any requirement. Please get in touch with us and we will be glad to help you. Kirana Billing Software is a simple software yet one of the most widely known and is build to support an individual or a chain business. It takes care of retail, distribution, accounting. Grocery Billing Software is a simple software yet one of the most widely known and is build to support an individual or a chain business. It takes care of retail, distribution, accounting. POS Software to handle time and billing tracking as well as invoicing customers for services and products. POS software can track the hours worked by employees as well as expenses associated with projects or clients. Stationery Billing Software is a simple software yet one of the most widely known and is build to support an individual or a chain business. It takes care of retail, distribution, accounting. We are a recognized entity, engaged in offering an excellent quality Bakery Billing Software to our esteemed clients. Clients can avail this software at pocket-friendly prices. Inventory management software is a software system for tracking inventory levels, orders, sales and deliveries. It can also be used in the manufacturing industry to create a work order, bill of materials and other production-related documents.